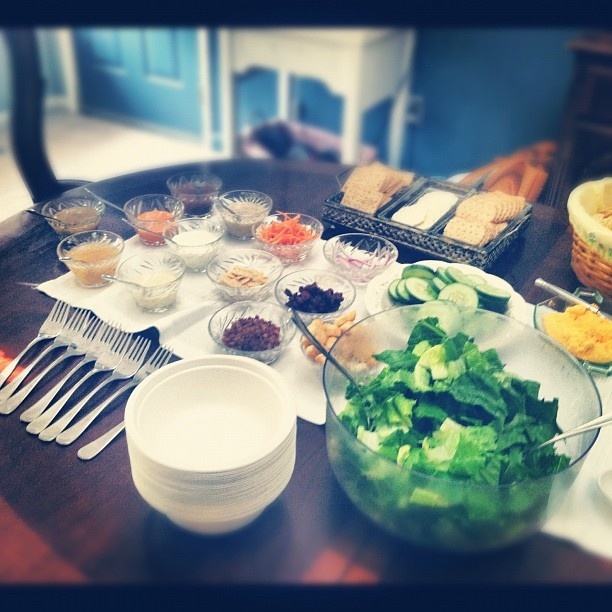 On my old blog, I blogged about having a salad bar party but I let that website lapse and created what is now Salty Heirs. I thought since this pin is pretty popular on Pinterest I would give the pin an actual home. I used small crystal bowls for my dressings and salad fixin's. At this party I used plastic bowls because I really wasn't in the mood to wash a bunch of bowls afterwards. But---- I did use real forks. Also serve crackers and a variety of cheeses to add a little oomph to the meal. Also a little Prosecco is nice.